It has been a phenomenal year for new cigars. 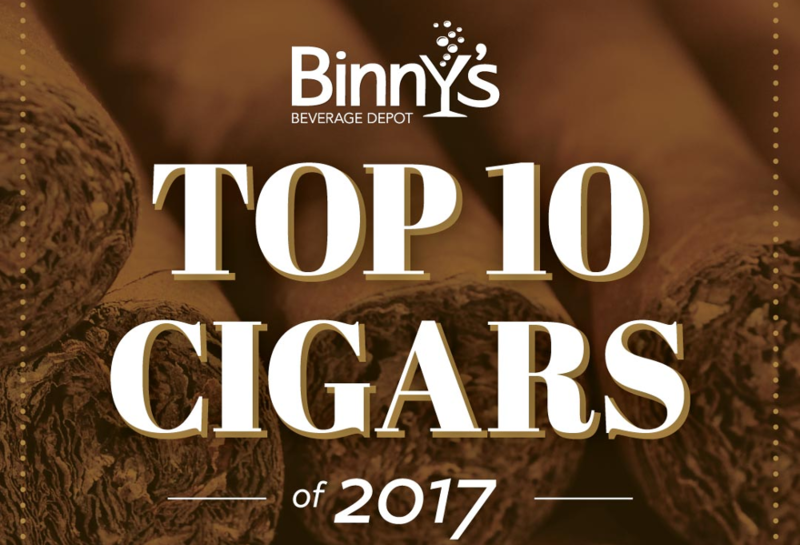 We have seen many new brands throughout the humidor and once again it is time for the Binny's Top 10 Cigars of the Year. This list is composed of the selections from your local Binny's Humidor Consultants. Without further ado, here are the top 10 Cigars of the Year. "Rich, smooth, and powerful, the Undercrown sungrown is an exemplar of Drew Estates quality." - Josh, Binnys Niles The Undercrown Sungrown has a beautiful reddish brown Ecuadorian sumatra wrapper that covers a delectable Connecticut River Valley sungrown habano binder. Within the cigar are some of the highest quality Nicaraguan fillers available. This Cigar immediately impressed us and is a shining example of quality tobacco, quality blending and quality construction. Released this year the sungrown has been a rousing success and now its time to grab some for yourself and see whats got us so excited. "This cigar is smooth, creamy, pairs well with craft beers to sipping rum, (foursquare 2004) to a glass of Cab." - Rich, Binny's Wheeling The Macanudo Inspirado White boast a 6-yr old Ecuadorian Connecticut shade wrapper. Under this light, tan smooth looking wrapper, is a very fragrant Indonesian binder. These hold a blend of different San Andrean and Nicaraguan fillers aged up to 4yrs. Once again, a new release from this years IPCPR, the Macanudo White Inspirado had us excited from the first light. The smooth balance of cedar, cream and slight pepper has been masterfully combined to provide a fresh experience from a classic line. The Inspirado White is a great follow up to the success of the Inspirado Orange and has shown us a more complex side of Macanudo. "Think of the coffee style with the same name. This cigar is rich, earthy, bold and complex." - Erik, Binny's Oak Brook The Leaf by Oscar has been one of the most requested cigars in our history here at Binny's. Launched in 2015, the Leaf By Oscar comes wrapped in a low priming tobacco leaf. One of the best examples of "Don't judge a book by its cover" the leaf unwraps to reveal one of the most attractive, well constructed cigars available. This outside priming leaf holds the natural oils to the wrapper of the cigar leaving the wrapper slick and smooth. The Leaf is a uniquely packaged cigar that delivers on flavor and quality. "Long fillers and binder leaf from the volcanic soil of Nicaragua, this cigar is rich and roasted earth. The cherry atop this hot fudge sundae is a decadent Ecuadorian Sumatra wrapper. Silky, sweet and smooth, this is your cup of hot cocoa." - Jimmy, Binny's Downers Grove The La Gloria Cubana Coleccion Reserva is a reunion of sorts for General cigars and Ernesto Perez Carillo. These days it is common to see a guest blender returning to a line to blend a new cigar. The Coleccion Reserva is the best possible outcome of a guest blender. This marks the second time Ernesto has teamed up with his former employers at General Cigars, but unlike the Re+United brand in 2014, but this time around Ernesto is handling production at his factory. The new La Gloria Coleccion Reserva was blended in the spirit of the original La Gloria and based on a blend of his from 1980 according to Ernesto. "Impeccable construction and superior blending. This cigar brings everything together. It's the treat your missing in your humidor." - Benn, Binny's St. Charles Le Careme is paying tribute to one of the pioneers of French Cuisine Marie Antoine Careme. Caremes biggest contribution to the culinary world is the souffle. The cigar has been modeled after a chocolate souffle with its creamy smoothness and chocolate forward notes. Crowned Heads is known for paying tribute to legendary figures in history and this blend is exciting. I knew from the moment this hit our shelves it was destined for our list. A truly luxurious experience, Le Careme is a must for try for all smokers. "I couldn't get enough of this blend, So I pick the 91 rated Churchill size each time!" - Jen, Binnys Naperville The Time Flies Churchill was a surprise hit for us. This AJ Fernandez blended stick is another collaboration with the general cigar company. The Time Flies is decorated with a shining silver band. Foundry has long been known for their unique branding. The Time Flies features an Ecuadorian Habano 2000 wrapper surrounding a fine mix of different Nicaraguan tobaccos. The tasting notes include mocha, pepper, and coffee. "Despite the unusual packaging, the Leaf Maduro was a pleasant surprise-revealing a dark, oily wrapper and beautifully constructed cigar. The Leaf is medium-bodied, complex with a changing profile throughout of chocolate, earthiness, pepper and a hint of sweetness. Rich and flavorful to the end." - Kim, Binny's Lincolnwood The Second appearance of Leaf by Oscar on our list this year. The Maduro has been a huge hit. Similar to the Sumatra, this cigar is concealed by a low priming tobacco leaf. Once unraveled you reveal a gorgeous, smooth, dark, succulent-looking maduro. This oily dark treat offers us a hint of mocha followed by a pepper. This has become one of our best selling maduros and a true highlight of the Leaf line. "One of the sharpest looking cigars to ever grace our humidors, this pigtailed beauty smokes like a dream. Flavors of earth, charred oak barrels, pecans, and black pepper envelope the taste buds. Slow-burning and decadent, the 767 Golf impresses time and again." - Nate, Binny's Des Plaines 767 Golf is the address of the very first Binny's Beverage Depot as we know them today and the history behind our humidors starts there. This corona was made for us by the fine folks at Kristoff cigars and is an exemplary example of a premium cigar. We have had a few blends made for us throughout the years, but the 767 Golf stands out as one of the most popular. Based off a special Woodlawn blend done by Kristoff, the 767 Golf delivers in flavor, burn, and value. "The Avo Ritmo South America marks the third release in the Avo Synchro Series. This release shatters the Nicaraguan motif of its predecessors by utilizing tobacco from seven separate countries coherently, and with style. It stands tall as a smooth, incredibly balanced smoke which showcases a bold, unique flavor profile that transitions with ease, always ending on that perfect note (pun intended). Avo Ritmo South America will surely leave a long lasting impression on the cigar world as it certainly has on me." - Robert, Binny's Evergreen Park Avo has a distinguished past and a bright future. The Syncro line has given both a new looks and blends to this classic brand. The Avo Syncro Ritmo is a complex symphony of flavors working together to develop a Rythm. Ritmo meaning Rythm in Spanish offers us a true melody in the nuance of flavors and complexity of this blend. Once again Avo has appeared on the charts with another hit. Come with us and feel the Ritmo of these cigars. "Pepper, chocolate and coffee flavors dominate this medium-full bodied, box-pressed cigar." - Tony, Binny's Lake Zurich Prieto; Spanish slang for dark skinned. This broadleaf maduro wrapped Nicaraguan blend is a departure from the Honduran farms of CLE. Christian Eroia has once again blended a winner. The Prieto offers a medium bodied full flavor cigar that will entice the palate with chocolate and coffee notes rounded out with a smooth nutty finish. The Prieto is yet another wonderful cigar from this long standing icon in the cigar industry.